The Lowgill House Estate comprises the lands, farm buildings and other dwellings which have been associated with one of the three principal farms located in the hamlet of Lowgill, the others being Farr House and Lowgill Hall. The name is derived from a sale notice of 1850 and it is used here for the historical entity which varied in its composition and the status of its occupiers over the last 350 years and which, at times, was known by other names. There is a degree of uncertainty in the reconstruction given here, not least due to the habit of using the name John in every generation and every branch of the Cort family and, less frequently, Arthur, and the ambiguity of using junior/younger and senior/elder which change during a lifetime. Those involved in the estate ownership are distinguished by Roman numerals. The buildings are in Lowgill itself, apart from out-barns, and the land was mainly on the spur between the river Hindburn and Crossdale Beck This is an area of heavy soils on glacial till which is fertile when drained. The Hindburn meanders along a narrow trench (glacial tunnel valley), bordered by sandy terraces (holms or ayres). Another block of land (Helks), located on the site of a prehistoric landslide north of the Hindburn, belonged at times to the estate. Woodland runs along the steep slopes bordering the river, beck and landslip. The estate's early history can only be speculated about, based on what little is known about the hamlet of Lowgill and the parish of Tatham. The records show land was held in Tatham by Lords of the Manor and secondary landowners, back to at least the 1100s with subsequent transactions implying increasing farming activity. It is likely that much of the area, especially higher parts, would be left as woodland and 'waste' for grazing, as is suggested by use of land at 'Little Lowgill' for 'scaling's hay' in 1179 (scale = shieling = summer pasture).1 However, as early as 1319 there was a vaccary (cow ranch) at Lowgill with an “enclosed and dyked” farm called Edwardsclough (1323).1 Most of the named holders of land in these early records were probably landlords rather than farmers. However, in about 1581, William Stanley, 3rd Lord Monteagle, made a survey of Hornby Castle Estate’s possessions in which fifteen “Free tenants” (freeholders) and twenty-six “Tenants at Will” (tenants) were named for Tatham, together with the details of their holdings.2 Although most cannot be identified, it is likely that many of today's farms originated in those tenanted holdings which had an average size of 14 acres. Specific information about Lowgill House Estate begins with a datestone found on the property that identifies the presence in 1646 of Thomas Baynes, who is mentioned in the Manor Court Rolls, and of his son John who was a freeholder in 1657.3,4 It is possible that the datestone marks a rebuilding in stone that may have accompanied the change from tenancy to freehold with its right to transfer ownership. Interestingly, it was around that time when money might have been needed and freeholds sold, i.e. to aid the purchase of the forfeited Hornby Castle Estate by Major John Wildman in 1654, or the later purchase back around 1660 after the Restoration, when it ended up in the hands of the Earl of Cardigan.2 From then on an almost complete summary of the ownership of the estate is possible (Table 1). 1887 John Cort Livesey s. b. 1864 (BMD) m. ? By the time of the death of Arthur II (1779), as his will indicates, the estate included land on both sides of the Hindburn valley, in Lowgill and Botton (Helks).8 Whilst his son John III inherited the land ('estates'), husbandry gear and animals ('quick goods'), his wife (Jane) retained the house, half the chattels and the right to get 20 carts of turf (peat) from Linghaw Moss (on Slaidburn Road), until her death in 1813 (TFP). 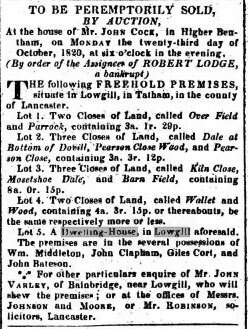 Son John paid Land tax as owner from 1782 to 1816, except for 1795 when William Bateson paid it, after obtaining possession of the house and land.9,10 The reason for that short-term transaction is not known. The prospectus for this sale gives the earliest detailed description of the estate's composition with field names and acreages. Whilst the former largely agree with those of the Tithe Survey a decade later, the areas are considerably smaller in 1839, being based on a customary acre. 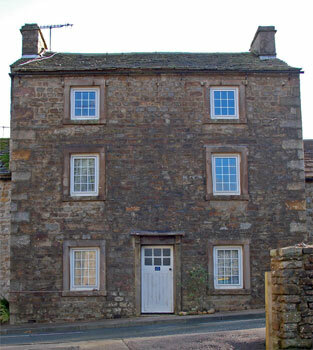 (The ratio with the the statute acre is about 0.65 which corresponds to a 8.5 yard rod, the largest of a range quoted for Lancashire.23) It also provides a clue about the building of East View and Ivy Cottage, probably Lots I & III, both described as "newly erected dwelling houses" tenanted by retired farmers, respectively Christopher Langstroth of Knott Hill and Henry Shepherd of Aitkengills farms. Lot II, Lowgill House and the main farm, was tenanted by Robert Blackburn, from 1838-1842.21 The land (closes) listed in Lot I correspond with those lying east of the road in the Tithe Map of 1848, when it was farmed from East View (see below).22 The references in the sales details to common right on Lythe Fell, Burn Moor, Tatham Moor and Bank Common are the first indication of what will have been a feature throughout the estate's history, i.e. the grazing of cattle and sheep on unenclosed land on the fells and moors ('waste'). It is not known where Arthur was living in this period, but he died in 1843 at Lancaster and was buried at Tatham Fells Church with his first wife.4 Consequently, after over 200 years of owner occupation, the land of the estate became farmed by a succession of tenants for the next 150 years. Comparison of land holdings of Lowgill Hall (East View) Estate: a) 1848 & (b) 2000. 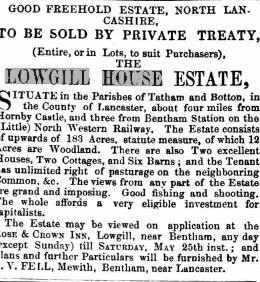 Subsequently, Dr Cort put the whole estate on sale on Sept 5th 1850 at the Castle Inn, Hornby, on the instruction of Blackburn solicitors, it comprising 2 houses, 3 cottages and 117 acres of land and common rights on the fells (Fig. 6).27 However, the purchaser, if any, is not known. It was sold again by someone on 25th May 1861, with particulars supplied by AV Fell of Mewith, when it comprised two houses, two cottages, 6 barns and land, again to an unknown purchaser.28 Significantly, this was just after Dr Cort's death in 1859 and he may have retained ownership until then.20 In 1856, when Tatham Moor was enclosed, Lythe Fell and Burn Moor became a regulated pasture with shares (stints) allocated according to the farm size.29 Dr Cort received 8 stints, equivalent to 16 cattle or 32 sheep and lambs. The farm, of course, continued to be tenanted. 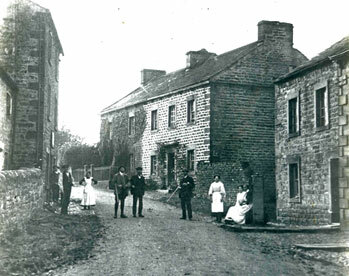 William Howson surrendered his tenancy to pursue his business interests, which included sales of fertiliser (guano) at Bentham and Settle,34 and the house and farm were apparently let or sub-let to Robert Whitehead (based on the acreages given in the census data for 1861 & 1871). 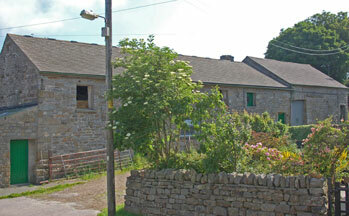 However, William Howson had returned by 1881 to Lowgill House but only to farm 17 acres, implying that this was the earlier small East View holding of 1848.22 He was present but not farming in 1891 and the later census records show Lowgill House occupied by Thomas Wilson (1901) and William Wolfenden (1911). William Howson's brother Robert also farmed at Lowgill in 1891 and it is presumed that this was then the main land holding farmed from East View, (then named Lowgill Farm) setting the practice which continued up the present, i.e. with the farm house separated from the original farm buildings across and down the road. The later tenants of this farm were Miles Taylor (1891), William Herd (Hird) (c.1901-1912), Roger Bowskill Herd (1913-23), (Washington (H)Alston 1924-34) and Edward Rawlinson (1935-41). By the time of a Land Tax Survey of 1909-13 (taxation not implemented), the ownership of the estate had descended to Thomas Livesey's widow Alice and her son John Cort Livesey, later vicar of Tatham Fells (1916-1929).33 After her death in 1913 it was transferred to a family trust. 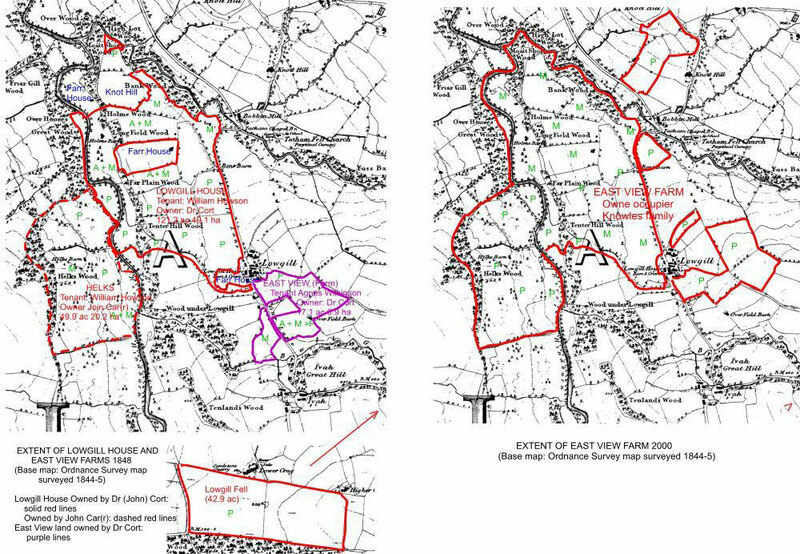 The survey shows that the land holding for East View (totalling 116 acres) was similar to that of 1848 for Lowgill House (but with Helks again owned) but the smaller East View holding of 17 acres was now in the possession of Thomas Carr of Lowgill Hall (perhaps exchanged for Helks). 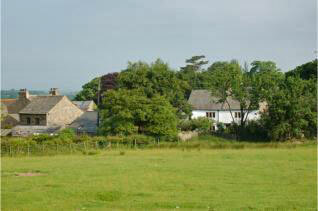 Also, Lowgill Moor was farmed by Richard Townley tenant at Brackenbottom although owned by Alice Cort in 1896. The farm buildings were still the range across the road from Lowgill House, comprising 2 barns and 2 shippons with space for 12 cattle. In addition, there were 3 outbarns with space ('lying') for 22 cattle. William Herd's annual rent was £80 and the tithe paid by him was £2 0s 5d. Significantly, several estate cottages were then being used used for animals, but Snap Cottage and Well House were tenanted (Thomas Wilson and John Bramwell, respectively). 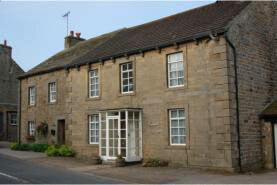 These two cottages were later sold in 1921 to William Bradshaw. In 1941, the main residue of the original estate, East View farm, was sold to Edward and John Knowles whose family still owns and occupies it. The wartime Farm Survey of 1942 gives the land holding as 121.5 acres with 28 % meadow, 67 % pasture and a token 6.5 acres of oats for the war effort.35 The livestock comprised 32 cattle and calves, 154 sheep and lambs, 3 horses and 45 hens. Thus, the land holding was still substantially the same as the main farm 200 years earlier, when Arthur Cort II died. Subsequently, land additions have resulted from the post-1940s sale of Farr House and Knott Hill farms and the amalgamation of Lowgill Hall farm with another, and it now totals 174 acres plus 23 acres of wood (Fig. 5b) and stints for 100 ewes on Lythe Fell (due to the decrease of stint holders).35 The old farm buildings are still in use but are now supplemented by a range of modern buildings behind the farmhouse and the stock has increased to 68 cattle and 275 sheep. Apart from two converted buildings (Stable Cottage and Peat House Studio), the other estate cottages are now all owner occupied, as are all the other dwellings in the hamlet. The changes affecting the Lowgill House Estate over the last 350 years took place against a background of larger scale social and economic changes affecting Tatham Parish. The parish in the 1600s had a relatively stable population based on agriculture, a little larger than at present, which only slowly increased up to the late 1700s.36 This was followed by a rapid increase over the next 40 years, peaking at nearly twice the present level in 1820, which must have created a demand for housing and jobs, and probably resulted in the growth of cottage industries. A subsequent rapid decline lasting to 1900 brought numbers down to below those of the 1600s, as a consequence of emigration to the industrial areas for economic reasons. A brief period of stability ended in 1950 with renewed losses, to a level in 1970 less that half that of 150 years earlier. The subsequent partial recovery is due to an influx of commuters and retirees, with consequent increase in owner occupation. Important contributions to this article have been made by Ann Dawson, Martin Knowles, Mike Winstanley and the late Ruby Murray. More work is needed by others to fill in the gaps in the story. Send contributions to Tatham History Society. 1 The parish of Tatham. Victoria County History. British History Online. 4 Tatham Parish Records of Baptisms, Marriages and Burials. 5 Hearth Tax Records. LRO & THS. 6 Melling Parish Records of Baptisms, Marriages and Burials. 7 Lancaster Marriage Bonds, Lancashire & Cheshire Record Society. 9 Land Tax Assessments, LRO & THS. 15 London Gazette, 13th March 1838. 16 Deeds, A. Dawson 2009, pers. comm. 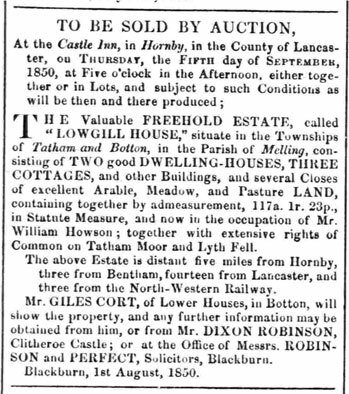 17 Blackburn Standard, 18th December 1839. 18 London Gazette, Oct 8th 1839. 19 London Gazette, 24th March 1840. 20 Preston Guardian, May 21st 1859. 21 Tatham Parish Tithe Payments, LRO & THS. 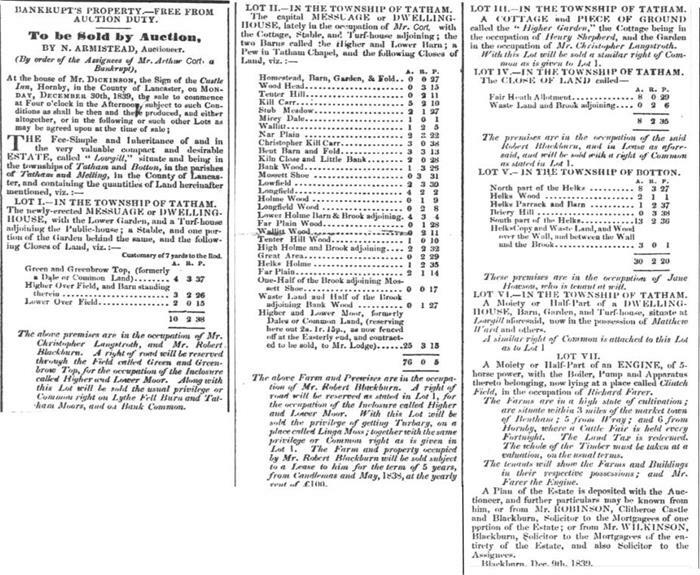 22 Tithe Act Survey Schedule & Map 1848, LRO & THS. 24 London Gazette, 20th July 1841. 26 Tatham 19th Century Agriculture THS. 27 Blackburn Standard, 14th August 1850. 29 Tatham Inclosure 1858 LRO. 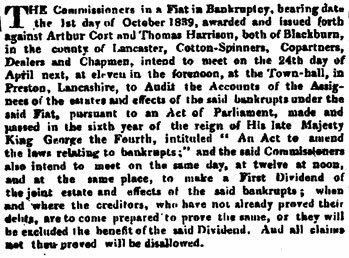 30 Lancaster Gazette 28th June 1856. 32 Agricultural Rate Returns 1896 LRO & M. Knowles. 33 Land Tax Survey 1909-13. 36 Population models for Tatham and Melling parishes, THS.